The author has addressed an area of WWII history that had received little previous coverage. He has done this very capably and used some excellent photographic illustration in photo plate sections. This is a gripping account of the very successful anti-shipping operations by RAF aircraft in the Mediterranean during WWII. DESCRIPTION: The author has addressed an area of WWII history that had received little previous coverage. He has done this very capably and used some excellent photographic illustration in photo plate sections. The RAF has never held any great enthusiasm for maritime patrol and combat, other than in making sure that the Royal Navy never re-acquired the responsibility for shore-based maritime warplanes. The most recent example is where the RAF were happy to see new Nimrod patrol aircraft scrapped, removing a British maritime patrol capability, to avoid any cuts in the numbers of obsolescent Typhoon II fighters. When the Royal Navy won back its Fleet Air Arm in 1938, the RAF clung to the shore-based maritime patrol responsibilities, but equipped the RAF Coastal Command with obsolete and largely unsuitable aircraft, beyond a few Short Sunderland and Catalina flying boats. With the outbreak of World War Two, it might have been overstating it to say that the RAF accelerated the re-equipment of Coastal Command with modern and capable aircraft. There was also little early effort expended in working collaboratively with the Fleet Air Arm. RAF neglect of the maritime patrol and warfare responsibility left a huge gap in air cover for the vital Atlantic convoys that were essential to linking Canada and the US with the British Isles. To address this serious deficiency, the Fleet Air Arm had to resort to desperate and innovative measures to provide convoy air cover in mid Atlantic, including the CAM suicide missions where worn out ex-RAF Hurricanes were mounted on catapults in the bows of merchant ships. Once launched, the FAA fighter pilot stood little chance of ditching in the sea and being picked up by a passing ship and no chance of reaching a land base. The RAF was not perhaps deliberately neglectful, but their primary mission was seen as strategic bombing and providing some point defence fighter cover at home. If there was any resource left over from those roles, it was shared out between maritime warfare and army co-operation. However, the end result was that Britain was ill-prepared to fight a war with naval aviation. The Royal Navy had a small number of carriers and mostly obsolete biplanes left over from the RAF period of total aviation control, in the same way that the army was ill-served in aviation assets and dependent still on RAF support. The RN at least had been given almost two years to correct the neglect of naval aviation by politicians and was rushing into service some very capable new carriers and fighting hard for the funding to replace its obsolete aircraft with machines able to hold their own against enemy machines. Although politicians and senior RAF commanders had seriously neglected those parts of naval aviation they stubbornly denied the FAA, the pilots and crew of Coastal Command made commendable efforts to provide the best capability their inadequate numbers of obsolete aircraft permitted. As the numbers of Sunderlands and Catalinas increased, Coastal Command made the very best use of these modern flying boats and fought hard to acquire better landplanes, mainly by begging for obsolescent medium bombers from Bomber Command. One of the bright spots in the Coastal Command story was the acquisition of Bristol Beaufort and Beaufighter twin engine attack aircraft. Bristols had developed, as a private venture, the Bristol Blenheim bomber from a commercial design. This aircraft used two radial engines and provided an internal bomb bay in a clean, fast monoplane design. It was a huge step forward when compared with the biplanes then in RAF service and its speed and handing encouraged its use also as a fighter, a role in which it suffered deficiencies and as a night fighter, a role in which it excelled on introduction. A number of these fast bombers were used for maritime warfare and provided the route for the development of an effective monoplane torpedo bomber, the Bristol Beaufort. As these designs used radial engines, they were favoured by an Air Ministry desperate to allocate every possible Merlin engine for fighter production and then for heavy bomber production. The radial also had the attraction that it tended to survive light anti-aircraft fire that was encountered when attacking ships and surfaced submarines. The Bristol drawing office was also working on what the company saw as the real ground and sea attack aircraft. The Beaufort was a light development from the Blenheim and available faster than a major redesign would have been, important at a time when Britain was desperate for anything that could fly even with the lightest armament. The resulting Bristol Beaufighter bore a strong family resemblance but it was a superlative multi-role aircraft that was to serve in all the major theatres of war and was feared by the Japanese who named it “The Whispering Death”. Where the Beaufort had looked much like the Blenheim V, but equipped to carry torpedoes in its bomb load options, the Beaufighter was a pugnacious short-nosed machine with a heavy fixed machine gun armament firing forward and a token single flexible gun mount in a mid-upper blister canopy. As such, the Beaufighter was a fighter flown by a pilot who controlled the forward armament and the weapons carried internally, under the fuselage and under the wings. This made it an excellent and rugged attack aircraft for ground support and for naval operations. It was flown by FAA pilots in addition to RAF pilots and the FAA considered adapting it for carrier operations but demands for resources saw those intentions fade away. It could operate as a heavy long-range fighter, a bomber, a torpedo bomber and eventually with unguided rockets. 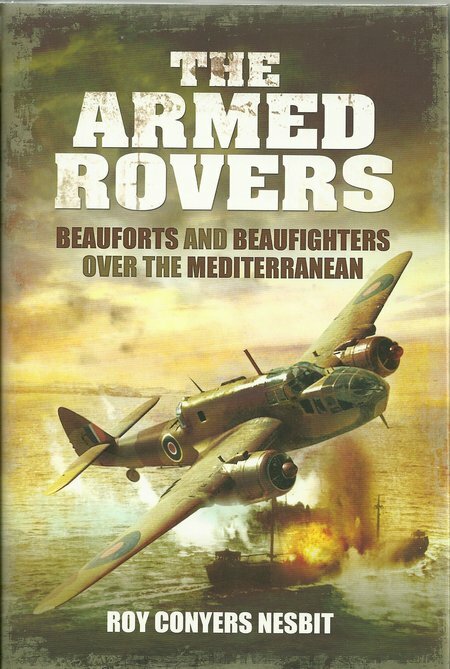 The author has covered the operations of Beauforts and Beaufighters in the Mediterranean theatre, basing the story on British and German records, with vivid first-hand eyewitness accounts. As the WWII veterans reduce in number with increasing rapidity, every book with eye-witness accounts and insight into combat experience seventy years ago is very welcome. The number of Beauforts and Beaufighters operating from Malta and Egypt were not great in number but they played a critical role in the defeat of the German Afrika Korps and Italian troops in North Africa. They made it impossible for the Germans to maintain the convoys necessary to supplying Rommel’s Afrika Korps with fuel, food, munitions and other vital equipment. The Beauforts and Beaufighters spotted and attacked individual ships and convoys attempting to run across the short distance from Italy to North Africa. They were so effective that the Germans even went to the extreme of trying to build an airbridge with powered heavy assault gliders, also to fail in that attempt with beaufoghters accounting for a number of these ungainly machines.